Although trees can survive perfectly well without thinning branches, thinning your tree branches can actually help your trees to thrive. Since your tree must pull in sufficient water and nutrients to feed all of the branches and leaves throughout the tree, growth can be demanding on a tree’s roots. When tree branches are thinned out, the remaining branches will receive more water and nutrition from the soil. In addition, the leaves of the tree will be more likely to have full exposure to the sun. So, in short, your tree will be healthier than ever. You may want to thin out your trees to improve the value and beauty of your property. Thinning your trees can provide you with a better view, especially if you’re looking to capture a mountain view from your western facing patio. Thinning your trees can also improve the look of your property if your trees are overgrown. Overgrown trees can grow into each other and other plants and shrubs around your property, and thinning out the branches gives your landscape a more “tamed” look. The lower branches of trees are often thinned out to make your property more navigable. If you have a tree in the center of your yard, for instance, you may want to prune its lowest branches to make your lawn easier to mow. Thinning out your trees can reduce the risk of an uncontrollable fire on your property. As we just mentioned, thinning out both your tree branches and the population of trees on your property can reduce the risk of fire endangering your property and home. Thinning out your trees is an especially good idea if you live in a rural, mountainous area, where wildfires are most likely to spread. For this very reason, tree thinning is a common practice in state and national parks. Here at Lumber Jack & Jill, we know trees. 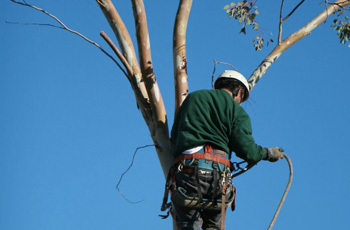 As your local arborists, we can assess the trees on your property and thin your trees appropriately. We know how and where to thin your trees to improve their health, to improve your safety, and to improve the value of your property. Lumber Jack & Jill has been operating here on the Front Range for over a decade, providing tree care services, including tree thinning. If you’re ready to get started, or if you have any questions, don’t hesitate to get in touch with us!